Background and aims: Midgut carcinoid tumours are uncommon tumours with an unpredictable clinical behaviour and few useful prognostic markers. Somatostatin analogues are widely used in treatment but a survival advantage has not been proven. We analysed features associated with poor prognosis and assessed the clinical implications of the biochemical response to therapy. Methods: Clinical and biochemical data were collected for patients with midgut carcinoid tumours attending a tertiary referral neuroendocrine clinic from 1978 to 2000. Using death as the end point, univariate and multivariate survival analyses were performed to identify prognostic indicators. The significance of altering biomarkers with therapy was also studied by including repeated measurements of the most prognostic biochemical parameter in a time dependent covariate survival analysis. Results: We identified 139 patients with sufficient data for our analyses. Factors associated with a poor outcome on univariate analysis included: plasma neurokinin A (NKA), urinary 5-hydroxyindolacetic acid output, age, and ⩾5 liver metastases. Plasma NKA was the strongest and only independent predictor of outcome on multivariate analysis. Patients in whom NKA continued to rise despite somatostatin analogues had a significantly worse survival than those in whom NKA stabilised or fell (one year survival rate 40% v 87%). Time dependent covariate analysis concluded that survival was better predicted by the most recent plasma NKA value rather than by the initial value. Conclusions: Plasma NKA is an accurate marker of prognosis for midgut carcinoid tumours. This is the first paper to support a survival advantage in patients in whom plasma NKA is altered by somatostatin analogues. Somatostatin analogues are the most widely used therapeutic option for midgut carcinoid tumours. They are generally well tolerated and highly effective in reducing symptoms.13,14 Biochemical markers are altered by somatostatin analogue therapy; reductions in plasma neuropeptide K, neurokinin A (NKA), chromogranin A, and urinary 5-hydroxyindolacetic acid (5HIAA) have been reported.15–17 Somatostatin analogues may have antitumour effects18 and there are occasional reports of dramatic clinical responses.19 However, tumour regression is modest and a survival benefit has not been definitively proven. NKA is an important member of the tachykinin family and plasma concentrations are elevated in patients with midgut carcinoid tumours.20 Both NKA and substance P (SP), another similarly structured tachykinin, are known to have effects on gastrointestinal motility, vasodilatation, and flushing, and can be associated with effects on lymphocytes and mast cell degranulation.21 Both NKA and SP are stored and secreted by classical midgut carcinoid tumours.22,23 Neuropeptide K is an N terminal extended form of NKA.24 Raised concentrations were noted in the plasma of 46% of patients with midgut carcinoid tumours.12 Members of the tachykinin family are used in several centres, including Belfast, as biomarkers for midgut carcinoid tumours. We hypothesised that plasma NKA would be a useful independent marker of prognosis and that a reduction in circulating concentrations of NKA by somatostatin analogues would be associated with a survival benefit compared with biochemical non-responders. This study reports a retrospective analysis investigating both NKA and other biochemical markers of prognosis and the clinical implications of altering biochemical properties with therapy. The study was approved by the Research Ethics Committee of the Queen’s University, Belfast. Sequential patients diagnosed with classical midgut carcinoid tumours from January 1978 to December 2000 were identified using a population based cancer registry and a separate clinical register established by a tertiary referral neuroendocrine tumour clinic. Clinical and biochemical data were collected from several sources, including hospital charts, pathology reports, and biochemistry laboratory records for each patient. Details of tumour characteristics, treatment, and circulating biochemical markers were recorded at diagnosis. For biochemical assessment at diagnosis, samples were taken within the first year of diagnosis and before any therapy other than the original surgery. Samples taken outside this period or after any other form of therapy were not included in the initial analyses. Results of circulating biochemical markers during the follow up period were also recorded to assess the impact of therapy on biochemistry and any associated effect on survival. The degree of metastatic disease at diagnosis was determined by combining the findings at surgery and those of a combination of radiological assessments. The findings of locoregional lymphatic disease or of multiple hepatic metastases were often made at surgery. Radiological assessment of patients was combined with surgical findings and varied over time, but most patients underwent ultrasound examination followed by cross sectional imaging with either computed tomography or a combination of computed tomography and magnetic resonance imaging if findings were uncertain. In addition, somatostatin receptor scintigraphy was performed on increasing numbers throughout the study period and provided additional information. By combining the examinations, an accurate determination of disease extent at diagnosis was made. Where small numbers of liver metastases were encountered, more than one method of assessment of the number of metastases was used to determine if there were more or less than five liver lesions. Biochemical assessments by radioimmunoassay where performed in the same peptide laboratory using the same protocols throughout the study period. All samples underwent one freeze-thaw cycle. The peptide laboratory provides clinical laboratory results for a large area of the UK and regularly performed quality control measures throughout the study period. Radioimmunoassay for NKA was performed using antibodies raised in guinea pig against human NKA (Bachem UK Ltd, St Helens, UK) coupled to ovalbumen using glutaraldehyde. The antibody is mid to C terminal and reacts with neuropeptide K on an equimolar basis. It also shows cross reactivity with SP (<10%). There was no cross reaction with other neuropeptides tested. Radiolabelled NKA was obtained from GE Healthcare (Amersham, St Giles, UK). Standard and quality control were prepared internally from synthetic NKA (Bachem UK Ltd) and from plasma prepared from midgut carcinoid tumour patients and these were included in all batches. Inter and intra-assay coefficients of variation were 9.8% and 6.2%, respectively, at a concentration of 22 pmol/l. The antibody was changed once during the study period, in 1994, and was validated against the earlier antibody without significant variation. For the majority of the study period, plasma pancreastatin28 was used as a surrogate marker for chromogranin A as a new assay was being developed for chromogranin that had not been fully validated. Unfortunately, as a result, reliable chromogranin A concentrations were not available. Initial analyses were performed to identify features at diagnosis associated with poor outcome. Comparisons of values between groups were made using non-parametric methods with Kruskal-Wallis one way analysis of variance ranks and the Mann-Whitney U test. Univariate survival analysis was performed using Kaplan-Meier survival plots and comparisons between groups made with the log rank test. Survival was measured from diagnosis; death due to all causes was used as the clinical end point with follow up taken to the end of 2002. The first available biochemical data were used and all samples were taken within the first year of diagnosis and prior to any therapy other than the original surgery. Covariates identified as having an influence on survival by univariate analysis were included in a multivariate analysis using a Cox’s proportional hazards model. Having identified features associated with poor outcome in the initial analyses, the prognostic significance of biochemical response to therapy was also assessed. 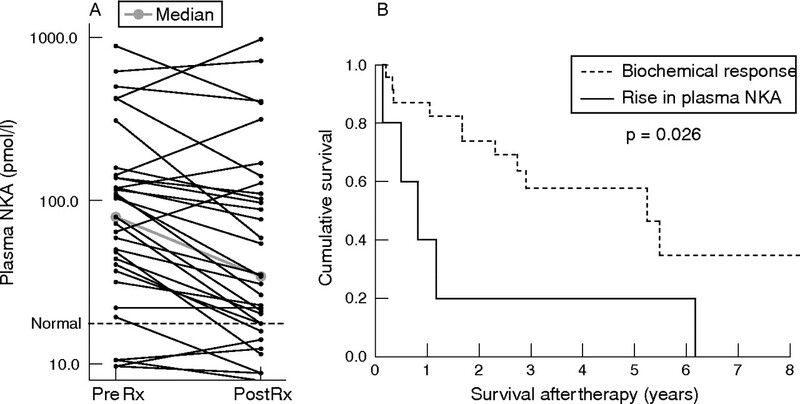 Kaplan-Meier survival plots and log rank tests were used to compare survival from treatment to death or end of follow up between biochemical responders and non-responders. To assess further the overall impact of biochemical response to therapy on survival, a Cox model was used including, as a time dependent covariate, the most recent biochemical measurement available. This time dependent covariate analysis was programmed to utilise all biochemical results by assessing the effect of the most recent plasma NKA on outcome at multiple time points for each patient. The analysis was then used to compare the effect on outcome of the most recent plasma NKA against the effect of the original plasma NKA to determine if altering this biomarker had any influence on survival. As this analysis took into account the timing of the sample and its effect on survival, all biochemical data could be used to determine the effects of altering the plasma concentrations of peptides with therapy. Each patient contributed to this analysis from the time of their first available biochemical measurement. Analyses were performed using SPSS version 11 (SPSS Inc, Chicago, Illinois, USA) and Stata release 7 (Stata Corp, College Station, Texas, USA). Clinical data were available for 139 patients; 64 were male and median age at diagnosis was 66 years (range 22–96). It was possible to determine the exact anatomical location of the primary tumour in 120 patients; six had multiple tumours involving more than one anatomical site. Most tumours were ileal (98) or caecal (22), with the remaining tumours located in the ascending colon (n = 1), jejunum (n = 3), or Meckel’s diverticulum (n = 2). Nineteen patients did not have surgical resection or biopsy of their primary tumour, making the precise anatomical site of the primary tumour difficult to confirm. All 19 had metastatic disease and two positive biochemical markers of midgut carcinoid tumours (plasma NKA and urinary 5HIAA output). In addition to biochemical features, all 19 had either histological confirmation of carcinoid tumour of the metastases or radiological evidence, or surgical visualisation of the primary tumour in the midgut region. Of the 10 patients with biopsy of liver metastases, only four did not also have evidence (radiological or direct surgical visualisation) of a primary tumour in the midgut region. In total, 111 of 138 (80.4%) patients had metastases at the time of diagnosis. Presence or absence of lymphatic spread was determined in 133 patients. Of these, 47 (35%) had regional lymph node disease, 55 (41%) had lymph node disease distant to the primary tumour, and only 31 (23%) had no nodal metastases. Of 137 patients for whom details were available, 52 (38%) had liver metastases. Seventeen had less than five liver metastases and the remaining 35 had five or more deposits. Other metastatic sites were: peritoneal seedlings (n = 9), bone (n = 5), ovarian (n = 5), skin (n = 1), umbilicus (n = 1), and breast (n = 1). One patient had disseminated metastatic disease with most organs involved. Surgery was performed on 121 (87%) patients. The primary tumour was successfully removed in 110 of these patients. In only 19 patients (16%) was the tumour diagnosed preoperatively. Median delay from clinical diagnosis to surgery was 49 days (interquartile range 25–118). Diagnosis was made by discovery of the tumour at surgery for the remaining 102 patients. Fifty four cases had either an incidental presentation or an acute abdominal emergency (with less than one month of preceding symptoms). When these patients were excluded, the median delay from first symptoms to diagnosis was 10 months (interquartile range 3–33). Sixty one of 100 patients with a recorded 24 hour urinary 5HIAA output at diagnosis had a raised output (median 76 µmol/24 hours (interquartile range 20–237); normal range <42). Fifty one (70%) of 73 patients had a raised plasma NKA concentration. Median initial concentration was 35.3 pmol/l (interquartile range 15.4–117.8; normal range <17.l). Sixty five had both urinary 5HIAA output and plasma NKA concentrations available. Fifty seven of these had a raised result for one of the tests (sensitivity 87.7%). Of the eight patients with negative results, all eight were taken after surgery and seven of the eight were considered to have had a surgical cure with no evidence of metastases in the immediate postoperative period. Both urinary 5HIAA (Spearman’s coefficient 0.64; p<0.001) and plasma NKA (Spearman’s coefficient 0.66; p = 0.001) strongly correlated with extent of metastatic disease (fig 1). There were significant differences in circulating biomarker concentrations between the groups with no metastases, local lymph node disease, distant nodal disease, <5 liver metastases, and ⩾5 liver metastases (Kruskal-Wallis, p<0.001). Relationship between circulating biochemical markers (5-hydroxyindolacetic acid (5HIAA) (A) and neurokinin A (B)) and extent of metastatic disease in patients with midgut carcinoid tumours. Plasma pancreastatin was raised in 24 of 56 patients (median concentration 18.9 pmol/l (interquartile range 5.4–75.8); laboratory upper limit of normal 27.1). Patients with documented liver metastases had significantly higher plasma pancreastatin concentrations (n = 28; median 67.7 pmol/l (interquartile range 21.7–148.9)) than those without (n = 28; median 6.8 pmol/l (interquartile range 4.1–17.6); p<0.001). Only four of 28 patients without liver metastases had a plasma pancreastatin concentration above the upper limit of normal. The positive predictive value of a raised pancreastatin for identifying patients with liver metastases was 83%. Pancreatic polypeptide was raised in 31 of 63 patients. There was neither a relationship with the extent of metastases nor a correlation with other biochemical data. Ninety four of 139 patients died during follow up. Median survival from diagnosis was three years (interquartile range 0.7–6.6). Survival rates (95% confidence intervals) at one, two, three, and five years were 82% (76–88%), 75% (68–83%), 68% (60–76%), and 53% (44–62%), respectively. Univariate analysis of all clinical and biochemical data revealed several factors with an adverse effect on survival (table 1). Variables with no significant effect on survival included lymph node metastases, <5 liver metastases, symptoms at diagnosis, and site or size of primary tumour. There was a trend towards worse survival in the 21 patients with echo proven carcinoid heart disease compared with the 34 with normal echocardiography (p = 0.076). For biochemical data, 73 patients had a plasma NKA concentration recorded but only 48 of these were within one year of diagnosis and prior to any therapy (other than original surgery). Of the 48 suitable for analysis, nine had NKA sampled prior to surgery but pre- and postoperative NKA did not differ significantly. Only one patient was considered to have had curative surgery and this was the only patient to have a marked reduction in NKA post-surgery (34 to 8 ng/l). Seventy nine of 100 patients with recorded 24 hour urinary 5HIAA output were suitable for analysis. With all seven covariates identified by univariate testing, only 20 patients had complete data providing an ineffective analysis with no significant results. Age, serosal breach, resection of primary tumour, and ⩾5 liver metastases were entered into an initial Cox regression analysis to identify clinical prognostic indicators. A total of 111 patients were included, and age was the only significant clinical covariate (p<0.001). Five or more liver metastases gave a raised hazard ratio but this was not significant (hazard ratio 1.82; p = 0.07). Age and ⩾5 liver metastases were used as baseline clinical parameters for further analysis with each of the biochemical markers added individually. Likelihood ratio testing was performed at each stage to determine which of the covariates best predicted risk. Biochemical predictors which were positively skewed were log transformed before analysis. Plasma NKA concentration (48 patients in the analysis) was the most significant predictor compared with plasma PST and urinary 5HIAA. These analyses confirmed that liver metastases did not independently predict outcome. Age and log transformed plasma NKA, PST, and urinary 5HIAA output were entered into a final Cox regression analysis (35 included). The only significant covariate was NKA (p = 0.002), confirming that it is the strongest and only independent predictor of survival. As the only independent marker of prognosis, initial plasma NKA concentration prior to therapy could be used to estimate survival for this cohort using Kaplan-Meier methodology (fig 2). Kaplan Meier plots of survival against plasma neurokinin A (NKA) ranges, with estimated survival probabilities. Of the 52 patients treated with somatostatin analogues, median time from diagnosis to starting therapy was six months (range 1 week to 21 years). Thirty three of these 52 patients had octreotide scintigraphy performed and 30 (91%) were positive. Plasma NKA concentrations pre and post-treatment were available for 33 patients. Median delay from starting therapy to measurement of plasma NKA was 74 days (interquartile range 28–124 days). Median NKA concentration pre-therapy was 79.4 pmol/l (interquartile range 34.4–140.3) and 34.4 pmol/l after therapy (interquartile range 16.8–119.1; p = 0.021) (fig 3). Excluding five patients with plasma NKA concentrations in the normal range before and after therapy, 22 patients had a reduction in NKA, one had no change, and five had an increase. Taking a reduction or stabilisation of plasma NKA as a measure of biochemical response, there was a markedly increased survival in responders compared with those in whom NKA increased post-therapy (one year survival rates 87% and 40%, respectively) (fig 3). Pretreatment plasma NKA concentrations were not significantly different in the two groups (median concentrations 104.6 pmol/l and 143 pmol/l, respectively; p = 0.15). (A) Plasma neurokinin A (NKA) concentration pre and post-somatostatin analogue treatment (Rx) and (B) Kaplan-Meier survival analysis of the effect of biochemical response on survival. Twenty patients had a reduction in urinary 5HIAA output following treatment with somatostatin analogues and 10 patients had an increase. This result of therapy was not associated with any effect on survival. Plasma pancreastatin concentration was also found to increase to more than double pretreatment levels in five patients; all of these patients died within 14 months. There were insufficient numbers to analyse the other forms of therapy. Seventy three patients had at least one recorded plasma NKA concentration, with median number of determinations being 4 (range 1–16). Initial plasma NKA (log transformed) gave the best survival risk stratification in the multivariate analysis at diagnosis. A Cox’s proportional hazards model was therefore established, including the initial plasma NKA concentration along with the most recently measured value which was incorporated as a time dependent covariate. 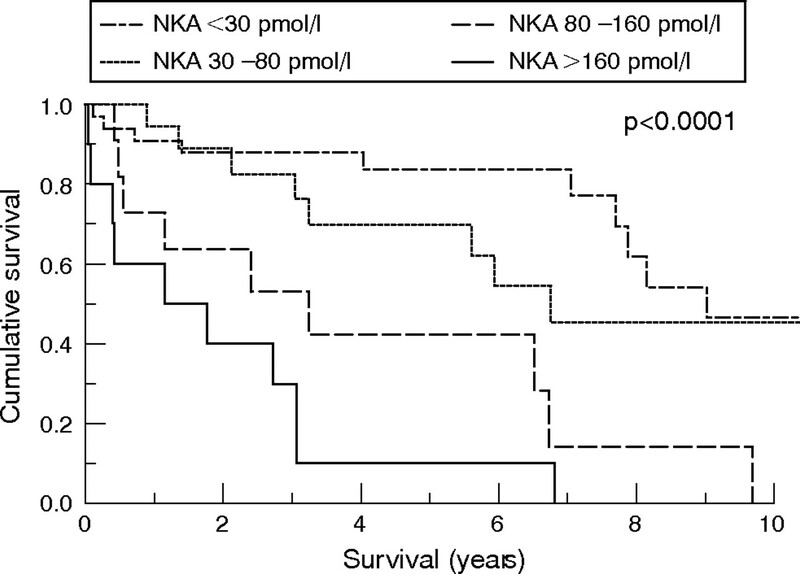 Effects on survival of the original plasma NKA concentration and the most recent concentration were compared (table 2) and the results indicated that survival was best predicted by the most recent result. Furthermore, bearing in mind that the initial plasma NKA was strongly related to outcome, the effect of the most recent plasma NKA results was greater than the original concentration. The influence of the most recent plasma NKA concentration was such that the influence of the original concentration ceased to be significant, thus suggesting that altering plasma NKA concentration had a strong effect on survival. Our results suggest that circulating plasma markers are the most important prognostic indicators for midgut carcinoid tumours. Plasma NKA was an independent prognostic indicator and had the strongest association with outcome. We propose that NKA can be used to identify patients with the most aggressive disease at an early stage in their management. All cause mortality was chosen as our end point but disease specific mortality was also analysed to determine if the prognostic marker results remained consistent. The results for disease specific mortality were identical to those shown, with the exception of age ceasing to be significant. The biochemical effects of treatment with somatostatin analogues are well recognised but their clinical significance, beyond symptomatic relief, is uncertain. This is the first study to assess the prognostic effects of altering biomarkers with somatostatin analogue therapy. We have shown that peptide secretion by midgut carcinoid tumours can be used to predict outcome, supporting the work of Janson et al on chromogranin A.12 However, prior to this study, the clinical significance of altering the biochemical properties of midgut carcinoid tumours with somatostatin analogue therapy has not been investigated. Neither has a definite survival advantage for treated patients been proven. Desai et al investigated the clinical significance of biochemical response to hepatic artery chemoembolisation, proposing that plasma pancreastatin may be useful in predicting response.31 However, no study to date has demonstrated the potential survival benefit of the known biochemical response with somatostatin therapy. Our results demonstrated a survival advantage in patients with a biochemical response to somatostatin analogues. In patients with a raised plasma NKA, a reduction of this biomarker following somatostatin analogue therapy was associated with an 87% survival at one year compared with 40% if it increased. Furthermore, a doubling of plasma pancreastatin appeared to be associated with a very poor survival. These observations are strengthened further by the larger time dependent covariate analysis concluding that prognosis is related more closely with the most recent plasma NKA. This implies that any alteration in NKA predicts improved, or worsening, survival. It is already apparent that monitoring of chromogranin A is useful postoperatively in detecting recurrence.32 We now propose that NKA is a useful clinical marker of response to therapy. At present, tumour response (regression or disease stabilisation) is difficult to determine and can only be confirmed over intervals with radiological investigations. In patients with severe progressive disease, it is not ideal to wait until there is progression of disease before deciding that treatment is inadequate. As a result, any early marker of treatment failure is a valuable tool. Sequential measurements of NKA in the follow up of patients with midgut carcinoid tumours could identify those not responding to treatment and allow more aggressive therapy before waiting for clinical deterioration. In summary, this is the first paper to demonstrate the relevance of plasma NKA in assessing the prognosis of patients with midgut carcinoid tumours. More important, however, is the survival prediction that it confers in response to treatment. These results are the first to provide evidence to support a better survival when there is a biochemical response with somatostatin analogue therapy. The authors would like to thank the Royal Victoria Hospitals Research Fellowship Committee and Novartis Pharmaceuticals for providing financial support for this research. The Royal Victoria Hospital Fellowship Committee awarded a grant to pay the salary for one year for G B Turner during research. A second year of funding for salary was donated as an educational grant from Novartis Pharmaceuticals. Watson RG, Johnston CF, O’Hare MM, et al. The frequency of gastrointestinal endocrine tumours in a well-defined population—Northern Ireland 1970–1985. Q J Med1989;72:647–57. Modlin IM, Lye KD, Kidd M. A 5-decade analysis of 13,715 carcinoid tumors. Cancer2003;97:934–59. Lauffer JM, Zhang T, Modlin IM. Review article: current status of gastrointestinal carcinoids. Aliment Pharmacol Ther1999;13:271–87. McStay MK, Caplin ME. Carcinoid tumour. Minerva Med2002;93:389–401. Greenberg RS, Baumgarten DA, Clark WS, et al. Prognostic factors for gastrointestinal and bronchopulmonary carcinoid tumors. Cancer1987;60:2476–83. McDermott EW, Guduric B, Brennan MF. Prognostic variables in patients with gastrointestinal carcinoid tumours. Br J Surg1994;81:1007–9. Shebani KO, Souba WW, Finkelstein DM, et al. Prognosis and survival in patients with gastrointestinal tract carcinoid tumors. Ann Surg1999;229:815–21. Agranovich AL, Anderson GH, Manji M, et al. Carcinoid tumour of the gastrointestinal tract: prognostic factors and disease outcome. J Surg Oncol1991;47:45–52. Madeira I, Terris B, Voss M, et al. Prognostic factors in patients with endocrine tumours of the duodenopancreatic area. Gut1998;43:422–7. Rorstad O. Prognostic indicators for carcinoid neuroendocrine tumors of the gastrointestinal tract. J Surg Oncol2005;89:151–60. Capella C, Heitz PU, Hofler H, et al. Revised classification of neuroendocrine tumours of the lung, pancreas and gut. Virchows Arch1995;425:547–60. Janson ET, Holmberg L, Stridsberg M, et al. Carcinoid tumors: analysis of prognostic factors and survival in 301 patients from a referral center. Ann Oncol1997;8:685–90. Schnirer II, Yao JC, Ajani JA. Carcinoid—a comprehensive review. Acta Oncol2003;42:672–92. De Herder WW, Lamberts SW. Somatostatin and somatostatin analogues: diagnostic and therapeutic uses. Curr Opin Oncol2002;14:53–7. Wangberg B, Nilsson O, Theodorsson E, et al. The effect of a somatostatin analogue on the release of hormones from human midgut carcinoid tumour cells. Br J Cancer1991;64:23–8. Schurmann G, Raeth U, Wiedenmann B, et al. Serum chromogranin A in the diagnosis and follow-up of neuroendocrine tumors of the gastroenteropancreatic tract. World J Surg1992;16:697–701. Shi W, Buchanan KD, Johnston CF, et al. The octreotide suppression test and [111In-DTPA-D-Phe1]-octreotide scintigraphy in neuroendocrine tumours correlate with responsiveness to somatostatin analogue treatment. Clin Endocrinol (Oxf)1998;48:303–9. Imam H, Eriksson B, Lukinius A, et al. Induction of apoptosis in neuroendocrine tumors of the digestive system during treatment with somatostatin analogs. Acta Oncol1997;36:607–14. Leong WL, Pasieka JL. Regression of metastatic carcinoid tumors with octreotide therapy: two case reports and a review of the literature. J Surg Oncol2002;79:180–7. Norheim I, Theodorsson-Norheim E, Brodin E, et al. Tachykinins in carcinoid tumors: their use as a tumor marker and possible role in the carcinoid flush. J Clin Endocrinol Metab1986;63:605–12. Severini C, Improta G, Falconieri-Erspamer G, et al. The tachykinin peptide family. Pharmacol Rev2002;54:285–322. Bishop AE, Hamid QA, Adams C, et al. Expression of tachykinins by ileal and lung carcinoid tumors assessed by combined in situ hybridization, immunocytochemistry, and radioimmunoassay. Cancer1989;63:1129–37. Norheim I, Wilander E, Oberg K, et al. Tachykinin production by carcinoid tumours in culture. Eur J Cancer Clin Oncol1987;23:689–95. Conlon JM, Deacon CF, Richter G, et al. Circulating tachykinins (substance P, neurokinin A, neuropeptide K) and the carcinoid flush. Scand J Gastroenterol1987;22:97–105. Fenoglio-Preiser CM. Gastrointestinal neuroendocrine/neuroectodermal tumors. Am J Clin Pathol2001;115 (Suppl) :S79–93. Williams ED, Sandler M. The classification of carcinoid tumours. Lancet1963;i:238–9. Moertel CG, Weiland LH, Nagorney DM, et al. Carcinoid tumor of the appendix: treatment and prognosis. N Engl J Med1987;317:1699–701. McGrath SJ, Johnston CF, O’Connor DT, et al. Pancreastatin-like immunoreactivity in human carcinoid disease. Regul Pept1991;33:55–70. Soreide JA, van Heerden JA, Thompson GB, et al. Gastrointestinal carcinoid tumors: long-term prognosis for surgically treated patients. World J Surg2000;24:1431–6. Burke AP, Thomas RM, Elsayed AM, et al. Carcinoids of the jejunum and ileum: an immunohistochemical and clinicopathologic study of 167 cases. Cancer1997;79:1086–93. Desai DC, O’Dorisio TM, Schirmer WJ, et al. Serum pancreastatin levels predict response to hepatic artery chemoembolization and somatostatin analogue therapy in metastatic neuroendocrine tumors. Regul Pept1996;96:113–17. Pirker RA, Pont J, Pohnl R, et al. Usefulness of chromogranin A as a marker for detection of relapses of carcinoid tumours. Clin Chem Lab Med1998;36:837–40. Competing interests: GT had one year of salary paid by Novartis Pharmaceuticals while undertaking this research. There are no other conflicts of interest.